After more than 2 weeks of learning user script from ground up and testing the user script, I’m proud to announce the release of MouseHunt Travel Advisory script created by me. 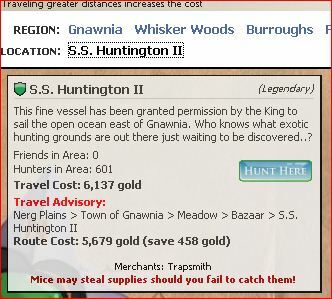 MouseHunt Travel Advisory is a user script that build specially for MouseHunt application in Facebook. It is able to calculate the cheapest route from player’s current location to location the player wish to travel to. It work similar to Pooflinger’s Travel Planner, but this script read player location directly from the application and embed the result directly into application instead of opening another tab for travel planner. 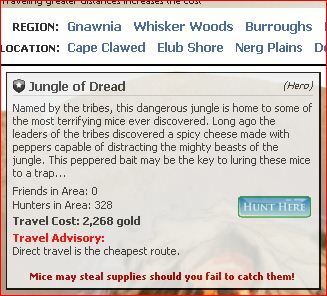 Travel advisory script load is whenever player open the travel page in MouseHunt after they installed the script. It will search and get all locations that is accessible by the player. It will then calculate the cheapest route to player’s selected destination base on locations that are accessible by the player. This allow the script to automatic route through Forbidden Grove when it is open (if necessary) and avoid Forbidden Grove when it is close. It will also avoid location that unable travel by the player currently (such as missing map piece). 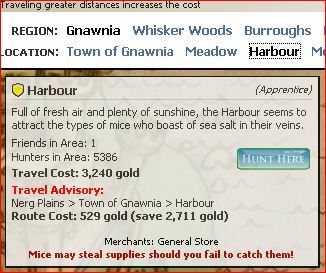 All travel cost are base on MouseHunt Wiki. Currently the script support Mozilla Firefox with Greasemonkey add-on (Tested with Mozilla Firefox 3.6 with Greasemonkey 0.8 add-on), Opera (Tested with Opera 10.50) and Google Chrome (Tested with Google Chrome 4.1). For more information and download, visit MouseHunt Travel Advisory website. Special thanks to Yew Liang, Matthew Phiong and Koekoe for helping me beta test the script.